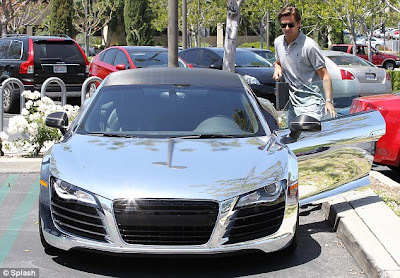 A long long time ago (I'm being completely sarcastic), Scott Disick purchased an Audi R8 and had it chromed out. After having it for roughly 6 weeks, he's selling it on ebay. According to Scott's friends at Calabasas Luxury Motorcars, this 2008 (so he buys his vehicles gently used) Audi R8 is for sale. Perks include: only 6,200 miles, it has a chrome wrap to it with the original color being black, black interior, 20 inch Forgiato Freddo - M Wheels, carbon style wrapped roof, rear decklid, mirror and blades, and more. Let's be real, Calabasas Luxury Motorcars has the best commercial out. The commercial I'm referring to is called Keeping Up With the Kardashians.